Update: I have a written a WP plugin to do this, click here to view the squarespace to wordpress plugin post. There is also an instructional video. Otherwise, you can use the more advanced method, outlined below. First, login to your square space website, click on structure > configure this page. Go down to Data Export and Export Blog Data to get a backup of your posts. This only works for squarespace posts not other content. Next go to your wordpress installation, click Tools > Import. Install the Movable Type and TypePad post importer plugin. 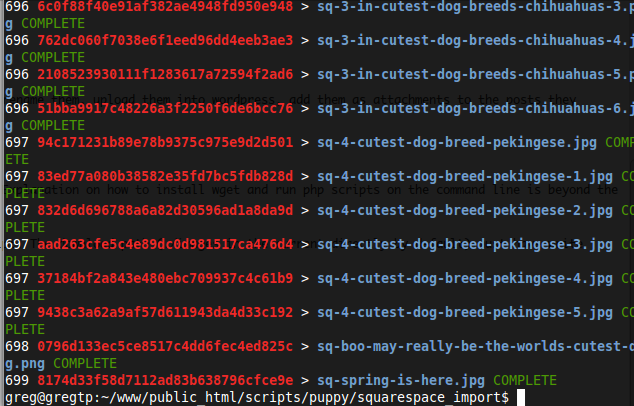 Now run this plugin on your exported squarespace posts and they will import into wordpress. It would be wise to create a new user when importing these posts so they are easy to identify. What we need to do is run a script that will go through our imported posts, download the squarespace images, rename them, upload them into wordpress, add them as attachments to the posts they belong to and change the html to reflect this. The tools run on linux/unix command line, it uses wget to download the file so you must have that installed. Explanation on how to install wget and run php scripts on the command line is beyond the scope of this post. Please do this on a local/backup copy of wordpress unless you are sure you know what you are doing and as always, make a backup first. This script also uses the php function shell_exec to run wget, some shared hosts may disable this, again it’s better to do this on a local development environment. Open config.php and set these constants. The squarespace prefix is important for use in a later script. The download path (./images in the current directory by default) must have write permissions for your user or just chmod 777. Once Add from server is installed use it to upload all of the images downloaded from squarespace. 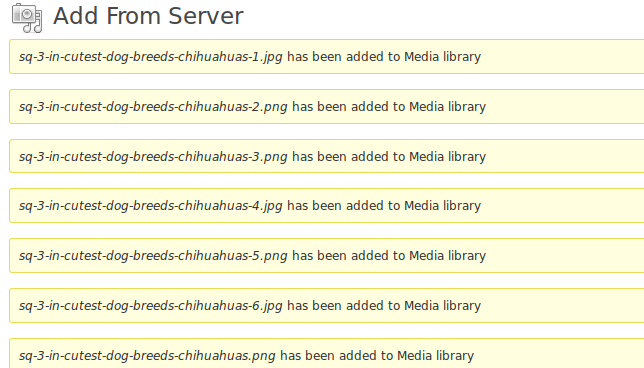 It’s under the media tab in the wordpress admin. You will need to copy your downloaded images folder to wp-content. Now that Add from server has uploaded your squarespace images and created the attachment data, we are going to link these attachments with their posts and update the image srcs to reflect the attachment urls. So there you have it, you’ve imported squarespace posts with images too! Hopefully this will be helpful to some people. You could write other script/conversion tools to cleanup the remaining squarespace html. I had to write several mini scripts such as the ones above to import things like squarespace galleries and other custom content types. If enough people need this, I could start writing a proper wordpress import plugin, or at least combine the three steps into one script. This approach could more or less be used for converting any site to wordpress that doesn’t have an official importer, so feel free to modify it. Update: There is now a wordpress plugin for this: click here to download the squarespace to wordpress plugin. Nice job programming the process. Between your solution and mine (http://robpickering.com/2010/07/moving-from-squarespace-to-wordpress-3) folks should have no issues moving off of SquareSpace and onto WordPress. Thanks Rob, nice blog by the way. Thanks for posting this. 🙂 This is REALLY excellent (and awfully nice of you). Wow! I will give this a try! I’m trying this on my mac using mamp. I get a database error when running the script. How does the script authenticate in wordpress and connects to the database? Also, is it failing because the mysql port in Mamp is 8889 and Apache runs on port 8888? I have my wordpress site install locally on MAMP. /Applications/MAMP/bin/php/php5.3.6/bin/php download_images.php in my case. The download images worked like a charm! 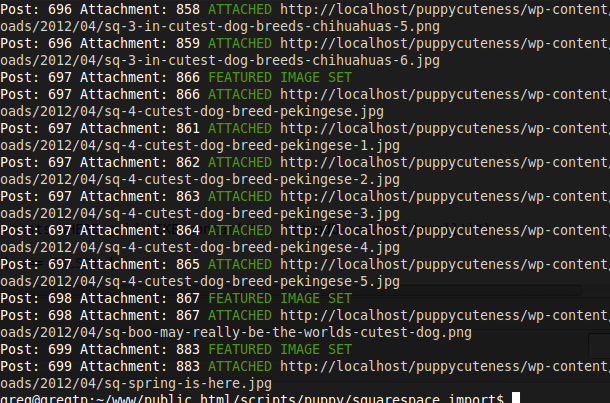 Unfortunately the second script, set_attachments.php is not working for me…. I run it, it waits a few seconds and then ends without any error, but it never does what is supposed to do. When you ran the first script, did it modify your posts? changing the old squarespace urls to the new renamed file name? 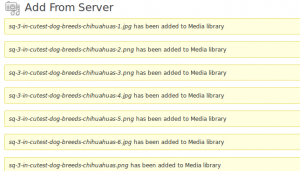 Did you upload your downloaded images using the ‘add from server’ plugin? The 2nd script updates your posts for the 2nd time, changing the partial urls set my script 1 to be the full attachment url – This will only work if you uploaded the attachments using ‘add from server’ (Otherwise they won’t exist). I downloads and renames the images successfully, but fails to change the old URL’s in the individual posts. I did import them using the add form server plugin. The images got downloaded and renamed correctly, but, in the first script there are a few lines of code that should also modify the URL’s pointing to the squarespace images in the post html. There must be differences in your original squarespace page code that differs to mine if it is not replacing the code in the post content. I just used this to convert a rather large site over so it does work and has for some others. I Recommend that you inspect the base code I provided and modify it for your needs. I can’t help you without seeing your specific use-case. On line 68 of download-images, it does a basic str_replace to replace the original squarespace url with the newly formed image name before saving the wordpress post. If this is not working for you then you’re squarespace urls could be different in some way. You could always run a debugger to see what it is trying to replace at your test for your test case. Feel free to provide me with a sql dump of your database and I see if I can reproduce your problem. You can send the link in the contact form above. 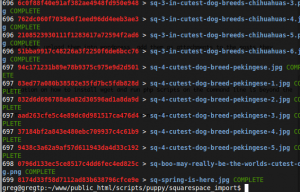 I sent you a link to a text file in my dropbox, just a few lines showing you the format of the Squarespace URL’s in one post. I am experiencing a similar issue. How exactly did you remove the portion of the domain? My image links are also slash storage slash etc. instead of yoursite slash storage etc. Does this work on hosted WordPress.com? Trying to look before I leap. 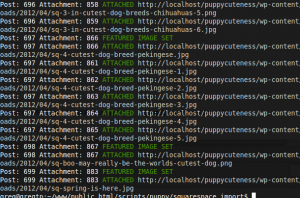 If not, I’ll likely use another hosting provider – not sure WP.com gives access to run *nix commands. I ensured that this is where the file is but it cannot seem to open it. Is there something I am missing here? Thanks in advance! It should be a path to wp-load.php not a url. I would like to point it to the root directory of my website (www.careerify.info) as this is where WP was installed. Your url may be careerify.info but your path would be something in the form of /home/careerify/public_html/wp-load.php. Thanks Greg, I’ll look into this with GoDaddy. Much appreciated! This is probably obvious but I guess I need to upload the script you provided to my site and run the php script from there right? I’m new to SquareSpace, and have attempted to run this script to migrate my SquareSpace site back to something more familiar: WordPress. I am not however, having any luck getting the script to run (or at least output any information) to show that it’s in fact grabbing the images. My question is: does this script still work with the latest version of SquareSpace? Does this process work with the latest iteration of squarespace? I ‘ve attempted to run the scripts via the command line, and they don’t appear to do anything at all. I’ve ran them verbose as well, they just run once and fail. Hi! I followed these instructions and nothing transferred over. I can’t imagine manually inputting every single post over again but its feeling like that is whats next.